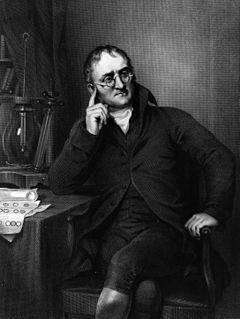 Early lifeJohn Dalton was born into a Quaker family at Eaglesfield in Cumberland, England. The son of a weaver, he joined his older brother Jonathan at age 15 in running a Quaker school in nearby Kendal. Around 1790 Dalton seems to have considered taking up law or medicine, but his projects were not met with encouragement from his relatives — Dissenters were barred from attending or teaching at English universities — and he remained at Kendal until, in the spring of 1793, he moved to Manchester. Mainly through John Gough, a blind philosopher and polymath from whose informal instruction he owed much of his scientific knowledge, Dalton was appointed teacher of mathematics and natural philosophy at the "New College" in Manchester, a dissenting academy. He remained in that position until 1800, when the college's worsening financial situation led him to resign his post and begin a new career in Manchester as a private tutor for mathematics and natural philosophy. Dalton's early life was highly influenced by a prominent Eaglesfield Quaker named Elihu Robinson, a competent meteorologist and instrument maker, who got him interested in problems of mathematics and meteorology. During his years in Kendal, Dalton contributed solutions of problems and questions on various subjects to the Gentlemen's and Ladies' Diaries, and in 1787 he began to keep a meteorological diary in which, during the succeeding 57 years, he entered more than 200,000 observations. He also rediscovered George Hadley's theory of atmospheric circulation (now known as the Hadley cell) around this time. Dalton's first publication was Meteorological Observations and Essays (1793), which contained the seeds of several of his later discoveries. However, in spite of the originality of his treatment, little attention was paid to them by other scholars. A second work by Dalton,Elements of English Grammar, was published in 1801.
that part of the image which others call red appears to me little more than a shade or defect of light. After that the orange, yellow and green seem one colour which descends pretty uniformly from an intense to a rare yellow, making what I should call different shades of yellowThis paper was followed by many others on diverse topics on rain and dew and the origin of springs, on heat, the colour of the sky, steam, the auxiliary verbs and participles of the English language and the reflection and refraction of light. Atomic theoryIn 1800, Dalton became a secretary of the Manchester Literary and Philosophical Society, and in the following year he orally presented an important series of papers, entitled "Experimental Essays" on the constitution of mixed gases; on the pressure of steam and other vapours at different temperatures, both in a vacuum and in air; on evaporation; and on the thermal expansion of gases. These four essays were published in the Memoirs of the Lit & Phil in 1802. There can scarcely be a doubt entertained respecting the reducibility of all elastic fluids of whatever kind, into liquids; and we ought not to despair of affecting it in low temperatures and by strong pressures exerted upon the unmixed gases further.After describing experiments to ascertain the pressure of steam at various points between 0 and 100 °C (32 and 212 °F), Dalton concluded from observations on the vapour pressure of six different liquids, that the variation of vapour pressure for all liquids is equivalent, for the same variation of temperature, reckoning from vapour of any given pressure.